During summer 2013, I was an intern at the Unmanned Systems Group at SPAWAR Systems Center (SSC) Pacific through the ONR Naval Research Enterprise Internship Program (NREIP). Located on a cliff overlooking the Pacific, the lab had a lot of great benefits-- sunsets over sandstone cliffs, their own beach volleyball court, a lot of robots, and people who are really passionate about what they do. It's one of the oldest robotics labs in the country-- Bart Everett started it in 1984 with less than 10 employees! Today, they're now world renown and are running over 40 projects with approximately 60 employees. The Throwable Robot (ThrowBot) was an attempted solution at an existing problem: most robots deployed in the field today are too bulky and large to carry for long distances and get into the spaces the warfighter is interested in. A robot that could be carried in the pockets of a warfighter's pants would be much easier to carry. Past iterations have been done by students at UCSD and past interns, however those designs focused on closed-cell foam wheels that could be compressed through a vacuum sealer-- however it was very difficult to compress the wheels in the field after use. (Note: these wheels were about 12" in diameter and were very effective at driving through and over most obstacles) I was responsible for the creation of a dual-bay payload configuration and more compact wheel designs. 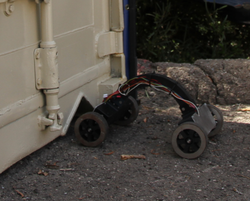 The MagCrawler was initially designed with the idea of having a robot that could traverse ferrous surfaces such as the sides of cargo containers to the hulls of ships. It did this through the rare-earth magnets embedded in the wheels of our flexible-linked robot. I was responsible for implementing radio control into the robot as well as field testing. The Small Unit Mobility Enhancement Technology (SUMET) ONR Vehicle Autonomy Program is attempting to develop a vehicle that can autonomously navigate through difficult terrain with relatively inexpensive sensors (in this case, multi-spectral cameras in addition to localization sensors). The sensor payload allowed the vehicle to categorize objects based on texture, spectral, and spatial signatures, navigate in a GPS-denied environment, and execute path planning. The particular vehicle I helped with, SUMET EV1, is part of this project that involves multiple labs, including SWRI. SSC Pacific has the role of systems integrator and further development and testing of the system. I assisted the software development with ROS and Python and assisted in training the object-classification system and modifying a velocity and steering controller we could use for vehicle testing. 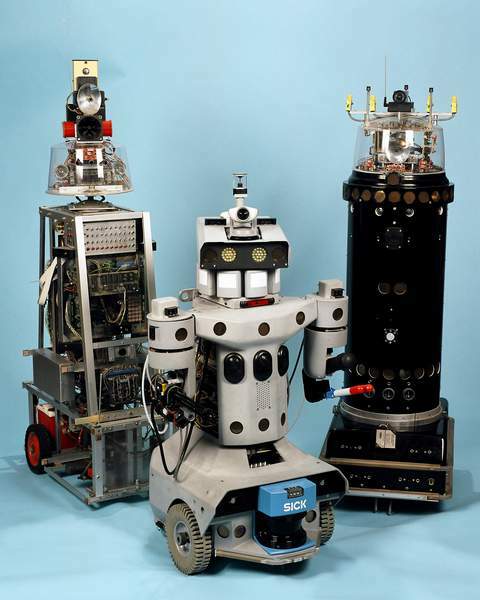 Bart Everett's robots, also known as ROBART I, III, and II, from left to right. Initially built for security and patrol purposes, these robots evolved from being fully autonomous to having semi-proximal autonomy-- ROBART III even has an autotracking gatling-gun style blowgun!